I got home last night and had NO IDEA what I was going to make for dinner. “What are we having for dinner? Scanning a cookbook of 30 minutes or less recipes, I found a recipe for Lasagna Rollups that I thought I could cobble together, in spite of the fact that the only ingredient in the recipe list that I actually had was the left over no-boil lasagna noodles. Cover the noodles with hot tap water in a 2 quart dish and microwave for about 4-6 minutes, until the noodles are softened. Then drain the water and lay the noodles on a clean kitchen towel to dry. I used a blend of mozzarella, asiago and smoked gouda because that is what I had. Combine the Greek yogurt (ricotta substitute :)), 2 c. shredded cheese, egg, basil and salt in a bowl. Combine the tomatoes, oil and garlic in another bowl. Spread half the tomato mixture in the bottom of a casserole dish. Working with the noodles from the short side, put 1/4 c. of the cheese blend on each noodle and top with spinach. 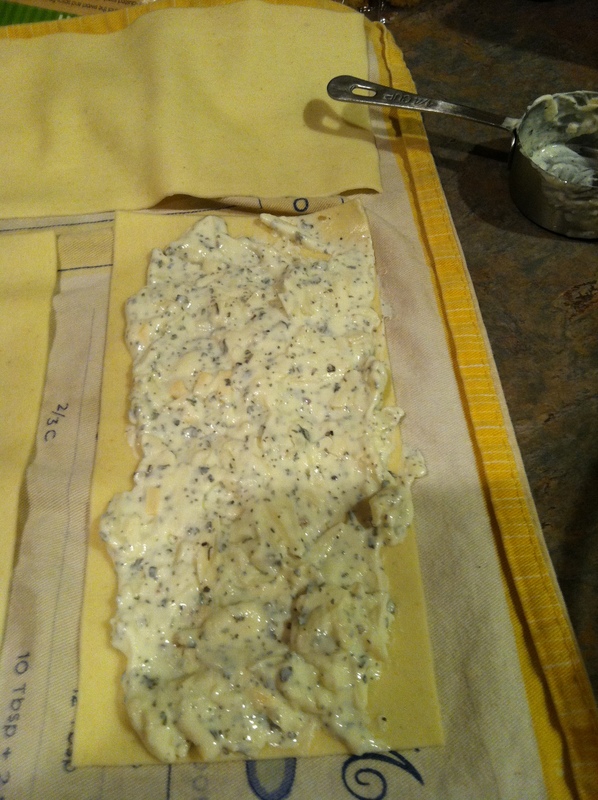 The dried basil and yogurt gave it sort of a Greek flavor. The kids had said they wanted the greens to be used in less obvious ways. What better way than to slip it into cheesy, tomato based, pasta goodness! 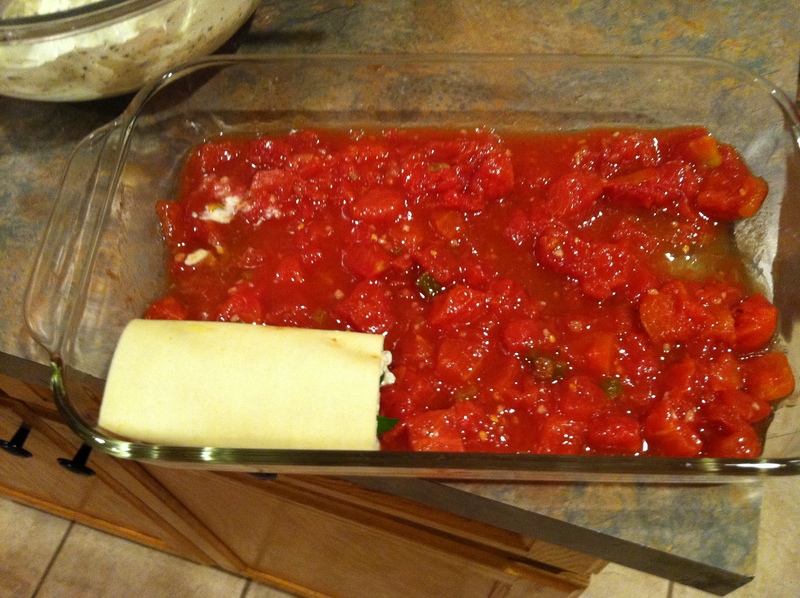 Roll the noodle from the short end and place it on the tomato mixture in the casserole dish, with the seam side down. Complete with all noodles. Pour remaining tomato mixture over noodles, then microwave casserole until the rolls are heated through (about 6 minutes). Remove casserole from microwave, top with remaining cheese, and place in oven on top middle shelf until cheese is toasty brown and melted. Remove from oven and let stand 5 minutes. You could add meat to the rolled up noodles or among the noodles in the tomato sauce. This was a flexible and yummy quick dinner, although I suspect it took me longer than 30 minutes. 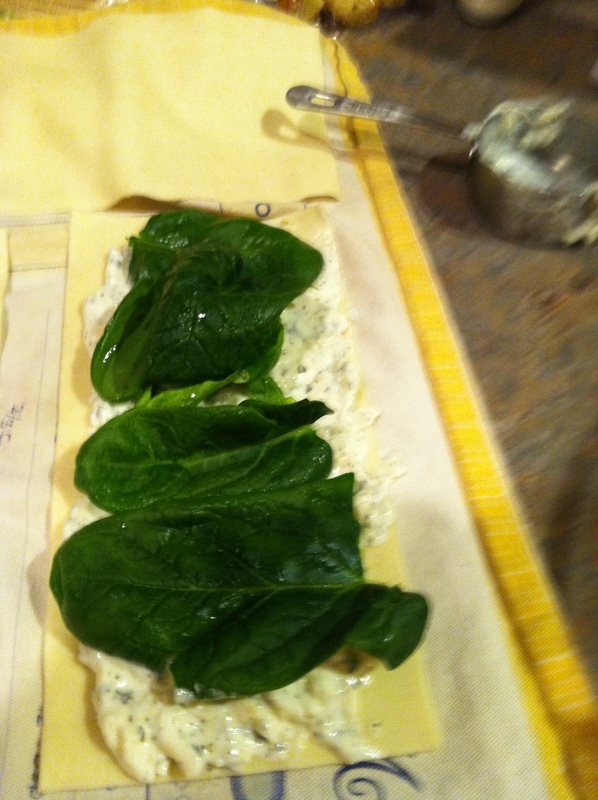 This was a great way to use my new spinach (more abut this week’s box tomorrow) and the greek yogurt. The kids didn’t give me pouty faces when I told them what was for dinner. 🙂 Who can be pouty when its lasagna, right?! 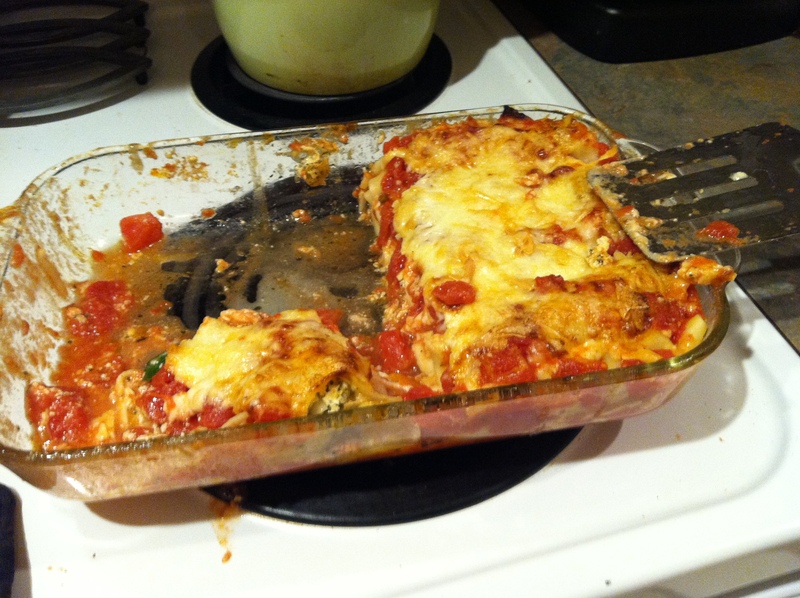 This entry was posted in Recipes and tagged basil, cheese, garlic, greek yogurt, no boil lasagna noodles, spinach, Tomatoes. Bookmark the permalink. Awesome! You’ve so got this ‘fast meal from CSA ingredients’ thing down. I never think to use my microwave to cook things. Yeah, your kids have no idea how lucky they are! My “dinner on the fly” is waffles and eggs or worse, soup from a can! Your roll ups look so delicious and gourmet! 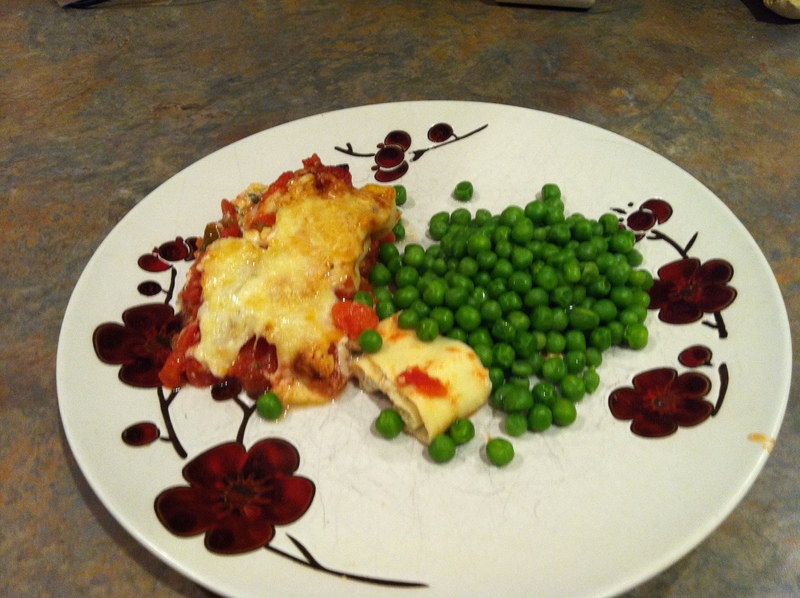 I have never used those no-bake lasagna noodles before. I am constantly inspired by your blog posts!